This is a typewritten, one page letter from Daniel Mascioli to his father, Leopoldo (Leo) Mascioli - interned at Camp Petawawa. 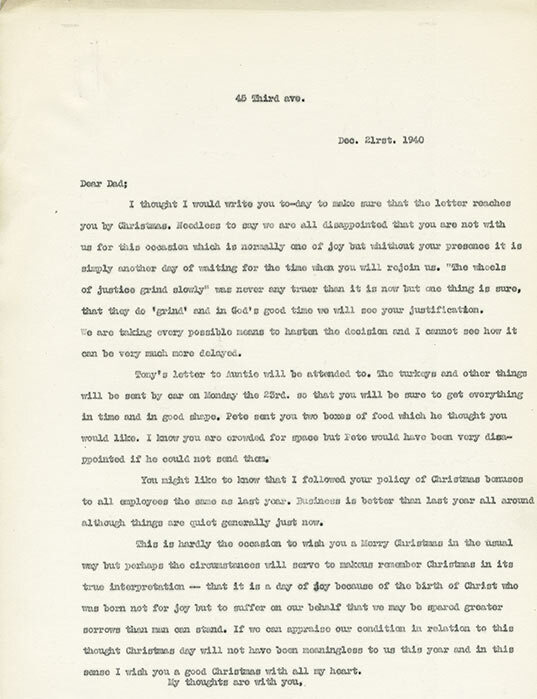 The letter is dated as December 21, 1940. Daniel begins by stating that the entire family is disappointed that Leo is not home in time for Christmas. He mentions that care packages have been sent which include turkeys and other things. He also informs his dad that he gave out the usual Christmas bonuses to their employees. This is hardly the occasion to wish you a Merry Christmas in the usual way but perhaps the circumstances will serve to make us remember Christmas in its true interpretation --- that it is is a day of joy because of the birth of Chirst who was not born for joy but to suffer on our behalf that we may be spared greater sorrows than man can stand. If we can appraise our condition in relation to this thought Christmas day will not have been meaningless to us this year and in this sense I wish you a good Christmas with all my heart. My thoughts are with you, Daniel.